Description: The basking shark is the largest fish that occurs in the waters around Britain and Ireland and the second largest fish in the world (the largest being the whale shark). It is easily recognised by its great size (usually around 7.5m but may be up to 11m), and five very large gill slits. It normally swims along close to the surface with its first dorsal fin, snout and tail fin breaking the surface. It feeds by filtering huge quantities of seawater through its gills and trapping planktonic organisms on its gill rakers. The coloration is greyish-brown to black with lighter mottling, the gills are bright red. Habitat: The majority of sightings of basking sharks have been in the summer months and mainly on days when the sea is calm enough to distinguish the large fins and snout breaking the surface. Despite its enormous size it feeds on planktonic organisms such as tiny crustaceans, jelly-fish and comb-jellies. 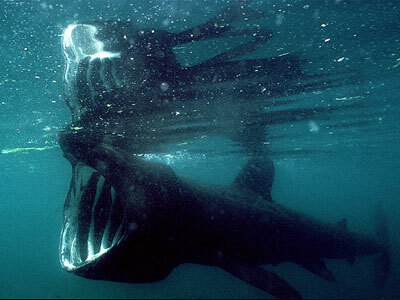 Distribution: The basking shark has been recorded from all around the coasts of Britain and Ireland. Picton, B.E. & Morrow, C.C. (2016). Cetorhinus maximus (Gunnerus, 1765). [In] Encyclopedia of Marine Life of Britain and Ireland.